I made a couple onesies this past month with heat transfer vinyl and my Silhouette. I love how little they are and how you can use all kinds of cute graphics. After all babies don’t typically fight you on your outfit choice. 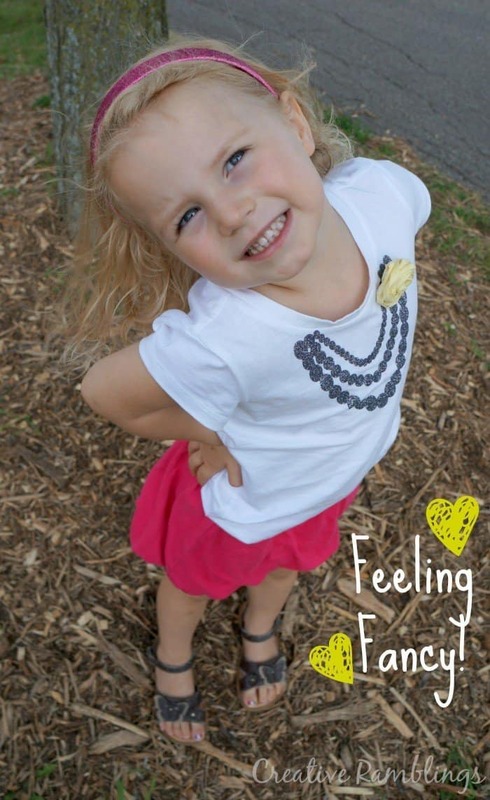 This week I decided my Little Lady (3) needed a HTV shirt of her own. HTV is my second favorite medium for my Silhouette, my first being glass etching. Ok maybe paper….and vinyl. Ahh, I love them all! Anyway, I really enjoy using HTV. When Baby Girl was born I made Little Lady this pillow that she proudly displays in her room. 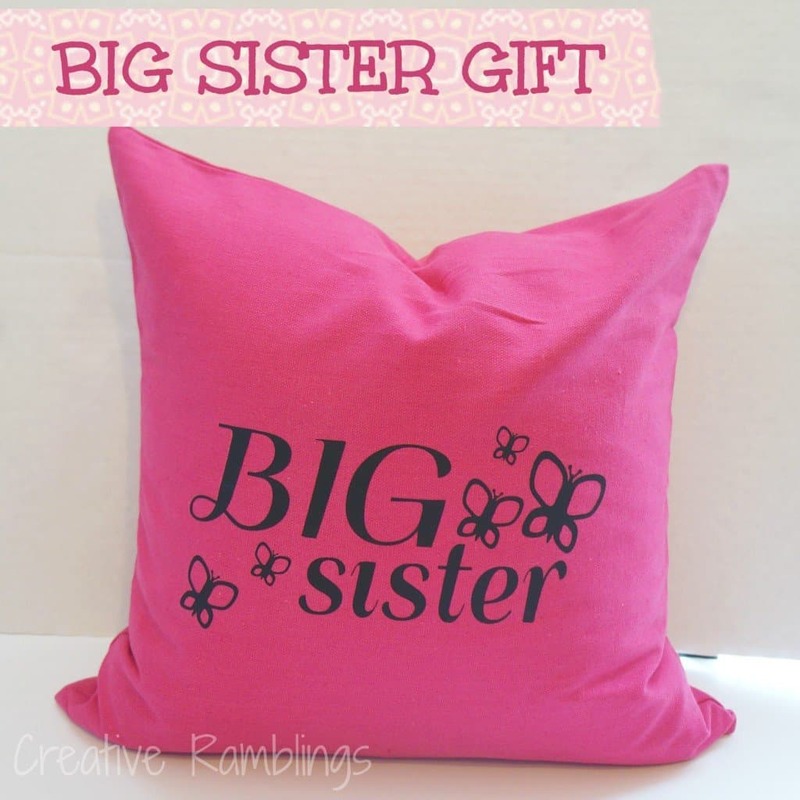 You can take a look at my Big Sister Pillow Post and download the cut file. I also made a grown up HTV pillow for my living room you can view here. 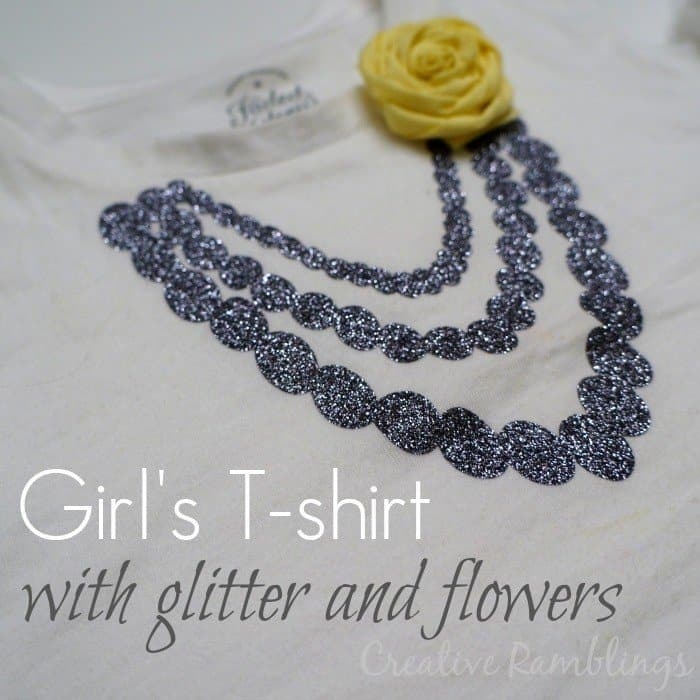 I chose to make a t-shirt for Little Lady with a glittery necklace, using glitter HTV, and flower; totally girly just like her. 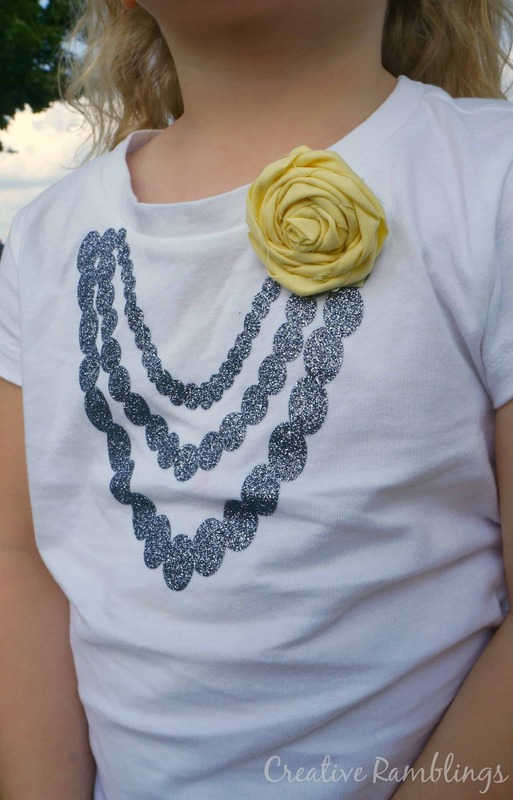 I opted to create my own necklace using the Silhouette software, and I’m sharing the cut file with you! You’ll find a link to download it toward the end of this post. This shirt was my first foray into glitter HTV. With a little help from my friends I found the perfect cut settings. Speed 5, thickness 15, blade 6. No mat. It weeded perfectly! I let Little Lady pick out a fabric scrap to use for the flower. She picked a pale yellow, a girl after my own heart. This shirt totally matches my living room. 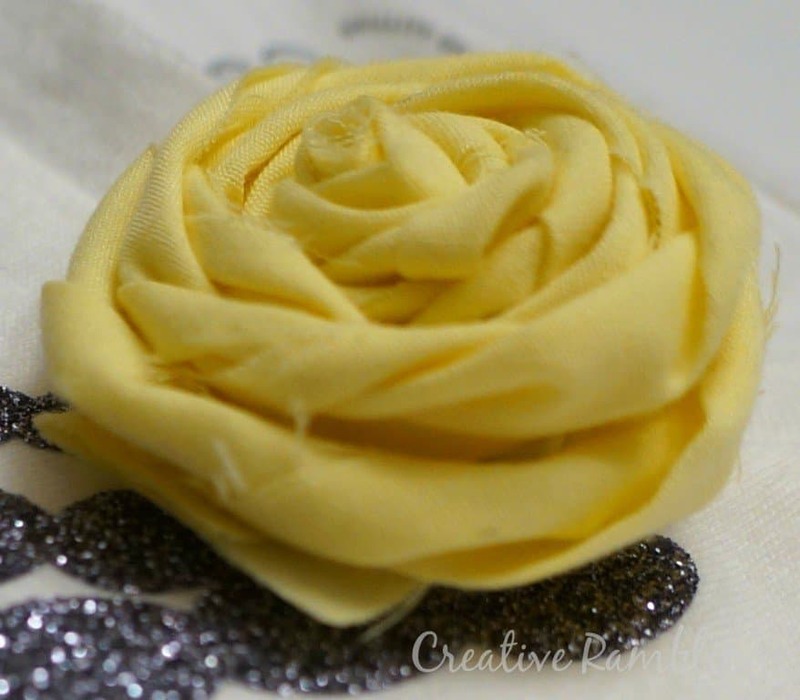 To make the flower I followed this incredibly well laid out tutorial from My Sparkle. I’m not even going to try to show you my steps, just go take a look at hers. I got a totally cute flower on the first try. I decided to use a safety-pin to attach the flower. That way I can wash the t-shirt. HTV is washable, however because this is so glittery I may just hand wash it. Feel free to download the necklace cut file, please use it for personal projects only. 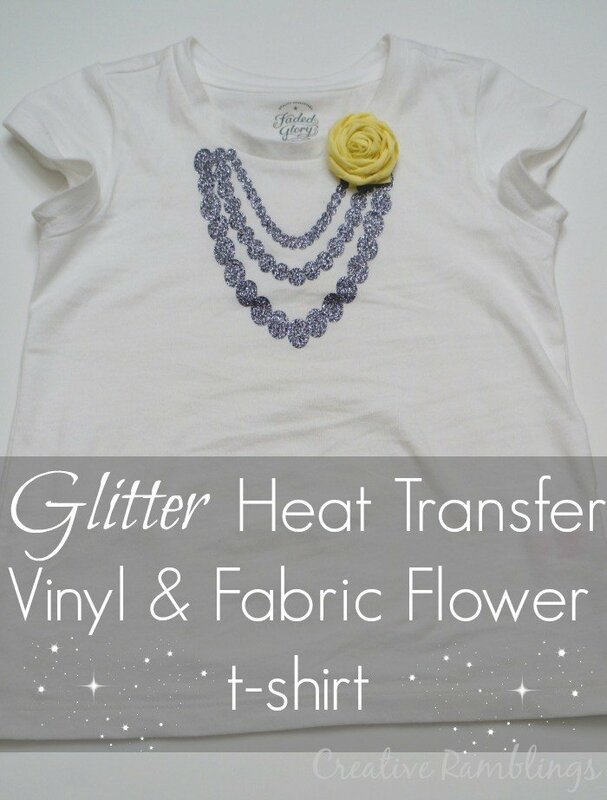 What projects have you used glitter HTV on, or what do you want to try? I’d love to see your projects. Like this post? I’d love for you to Pin it. Thank you Kira! Good luck, I so hope you get one. Thank you so much Theresa!